Besides exploring career opportunities, attendees like Wright State student Samuel Bertsos picture at right, learned what classes and activities to choose now to best prepare for their futures. Several hundred high school and college students interested in pursuing careers as doctors, nurses, veterinarians or other health professions converged on Wright State for presentations and tours. 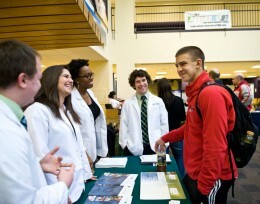 The university hosted Path to Health Professions Day on Feb. 20 at the Student Union. Nearly 500 people registered for the event, including guidance counselors and parents. Encouraged to attend was anyone interested in becoming a physician, dentist, pharmacist, physician assistant, physical therapist, veterinarian, nurse practitioner, psychologist, sports medicine professional or any other health professional. Also welcome were teachers and guidance counselors who wished to learn more about Wright State’s pre-med and pre-professional programs. Besides exploring career opportunities, attendees learned what classes and activities to choose now to best prepare for their futures. In addition to formal health-career sessions, participants had an opportunity to tour the anatomy labs and Wright State’s Boonshoft School of Medicine. The event featured exhibits by Wright State University, the Boonshoft School of Medicine, Case Western Reserve University, Kettering College of Medical Arts, Ohio University, The Ohio State University, Cedarville University, Northeast Ohio (NEOMED), University of Cincinnati, Ohio College of Podiatric Medicine, University of Findlay, the U.S. Army, the U.S. Air Force and Test Prep.